A very 'durable' plant that should be more widely used. Long lived, pest free, low maintenance. Foliage remains attractive all season and turns golden in fall. A favorite of swallowtail larvae in my garden. This is a native species that I am seeing a lot more in catalogs. It was also featured several years ago in Minnesota Horticulture. Well- established plants reach 2 to 3 feet in height and form a clump 18 to 24 inches around. 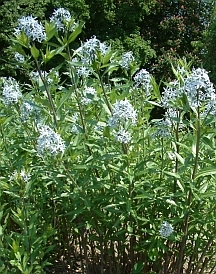 The flowers appear in early summer and are a lovely shade of pale blue. They make good cut flowers but the ends of the stems must be seared to prevent "bleeding." I've had a handful of plants for several years. Although they did not flower until the third year they have been remarkably maintenance free. I especially like the willow-like foliage that never flops and remains attractive well into the fall. New plants should be spaced about 2 feet apart. Division is not necessary - the plants resent disturbance.